With Thais being hesitant to buy a second hand home or car due to the possibility of unwelcome spirits, it’s not surprising that a building formerly housing a hospital would have problems finding tenants. If I remember correctly, this was originally the Thonburi Hospital and then Colin and his gang had it for a while. Since then, it became overgrown with weeds at the end of Soi only slightly better than Soi 102. However, ghosts or no ghosts, with or without potholes and a lack of parking (what’s with this guy and parking? ), it’s a heck of a lot closer than Singh Khon. 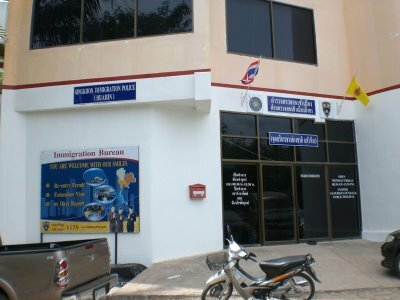 Bo Fai gets an international airport, then an immigration office. What’s next, a Top Charoen Optical shop?